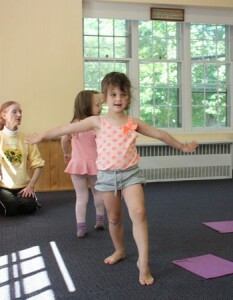 All of our students take music classes twice a week, while the 3’s and the 4’s kids learn to dance in creative movement. Creative Movement for 3 and 4-year-olds is a fun way to help children learn to move their bodies. In this class, children learn how to move through space, dimensions and dynamics of movement, tempo and levels, body parts and how they move, body shapes, pantomime and creative expression, stretching exercises and balance. Preschool music is a magical experience. We try to make every class a sensory adventure. For the 2’s, we work on comfort and joy and then go from there. We work a lot on body core movement, rhythms and feeling music in the children’s bodies. We work on songs and dances developing motor function, simple words and sounds. Music serves as a soothing and fun part of their day. For the 3’s, it is filled with imagination and amazing connections to language skills and listening skills. We do many rhythmic exercises and games throughout the year – all fun-filled but all geared towards their development. We work on feeling the beat in our body and using both words and movement for expression. For the 4’s, we continue on those same foundations, but add so much more. The NY Times many years ago referred to the 4’s as the adolescents of preschool, and that has always proved true. Fours, fours! Fours do more! I work with chanting for rhythm and language development. We delve deeply into deeper concepts. I have my ‘Rhythm Rangers” and my “Pitch Explorers” working diligently during our adventures. We add in musical terms, concepts of tempo and dynamics and kid-friendly classical pieces interspersed throughout the year. This is a performance class that breaks down the components of musical theater and teaches the students how to combine singing, dancing and acting into a cohesive piece. Children at all levels are exposed to classic and contemporary music theater, many styles of dance and movement, and the use of instruments and props. The class is broken up into 4 week units that end with an in-class performance which is filmed and sent to the parents. We encourage confidence-building by working with the microphone and performing for our classmates. We also learn how to be supportive of our peers and their unique abilities as active listeners and audience members. If scheduling allows we also perform a school wide show at the end of the year for families to attend!